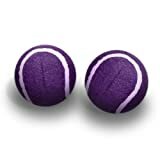 New from Top Glides - purple walker tennis balls! These high quality colorful tennis balls always seem to make people smile! They fit most walkers and are pre-cut to make installation easier and safer. The soft felt exterior is perfect to help protect floors. Recommended for indoor use. Available from Top Glides in pink, purple, gray, red, blue, and American flag style. Which is your favorite? Check our special discount on 4 pairs with a FREE UPGRADE to expedited shipping. Makes a great gift - check our $9.99 deal for 2 pairs!